Posted on Tue, Apr 3, 2012 : 11:48 a.m.
Michigan's winners of $250,000 prizes in recent Mega Millions lottery drawings are starting to collect, including a couple from Pinckney, according to a report on Mlive.com. 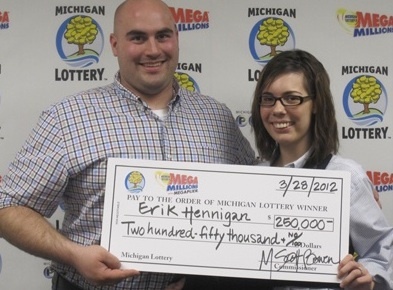 Erik Hennigan collected his prize with his fiancee, who wasn't named by Michigan Lottery officials. Erik Hennigan and his fiancee - who wasn't named by lottery officials - collected their winnings on Monday. They used a personal formula to choose the winning combination for the March 20 drawing. "If we had played the age we will be when we get married (30) as our Mega number, we would have won the jackpot," (Hennigan) told the lottery. That jackpot: $241 million, a bit shy of the record-setting $656 million. Wed, Apr 4, 2012 : 4:35 p.m.
Now here are some real hero. Thank you for everything. Wed, Apr 4, 2012 : 1:42 p.m.
Of course she wasn't named by Michigan Lottery officials. Her parents did that years ago. Tue, Apr 3, 2012 : 10:01 p.m.
Congrats! Make sure you donate some to a good cause, keep that good karma flowing your way. Tue, Apr 3, 2012 : 9:41 p.m.
Tue, Apr 3, 2012 : 6:50 p.m. He's getting married. It's as good as gone... lol! Congratulations to both and what a nice way to begin their lives together. Wed, Apr 4, 2012 : 1:08 p.m. I know. This comment is outdated. I was the one who pointed out the error and they removed my comment that said so, but I'm unable to delete this one. Tue, Apr 3, 2012 : 8:20 p.m. They won in an earlier drawing. They just claimed it recently. Tue, Apr 3, 2012 : 6:05 p.m.
Tue, Apr 3, 2012 : 6 p.m.
Tue, Apr 3, 2012 : 5:47 p.m.
Will the Barnstormer be ready for a really big wedding reception? Tue, Apr 3, 2012 : 5:40 p.m.
Tue, Apr 3, 2012 : 5:16 p.m.
Tue, Apr 3, 2012 : 5:04 p.m.
Congrats you two, enjoy your windfall! Tue, Apr 3, 2012 : 4:24 p.m.
Wasn't 23 the mega number? Tue, Apr 3, 2012 : 8:21 p.m.
Tue, Apr 3, 2012 : 4:56 p.m. I think it was. Strange. Tue, Apr 3, 2012 : 4:21 p.m.
That's wonderful. Good for them. Tue, Apr 3, 2012 : 4:12 p.m.
can I borrow 20 bucks? Tue, Apr 3, 2012 : 3:57 p.m.